How can I use MagBak to mount my iPad to non-metal surfaces? We are including a pair of MagSticks with each MagBak. These can be attached to any surface to allow the iPad to be mounted magnetically. Will the MagBak magnets harm the iPad? No. We've placed the magnets in the same locations as the Apple SmartCover and we've tested 3G/4G/Wifi/Compass functionality to ensure there is no interference. Can I take off MagBak from my iPad? Yes, you can simply peel the pads off. MagBak uses 3M adhesive that is specifically designed to peel off cleanly without leaving any residue behind. Watch the video of Leo Laporte talking about it here (@42:00). What iPad models does MagBak support? MagBak supports iPad 2, iPad 3rd and 4th generation, iPad Air 1 and 2, and iPad mini all models. MagBak is not designed to be reusable. The pads will get stretched and damaged when removed from the iPad. This is because we chose to make the MagBak adhesive very strong. We want to guarantee that the pads will not peel over time and that they will be strong enough to keep the powerful magnets in place. Yes, the MagStick is re-usable. The provided 3M adhesive is very strong, but it is also designed to come off cleanly. We recommend that you use a new 3M double sided adhesive each time that you put the MagStick on a new surface. Can I mount my iPad on the MagStick while the SmartCover is on? 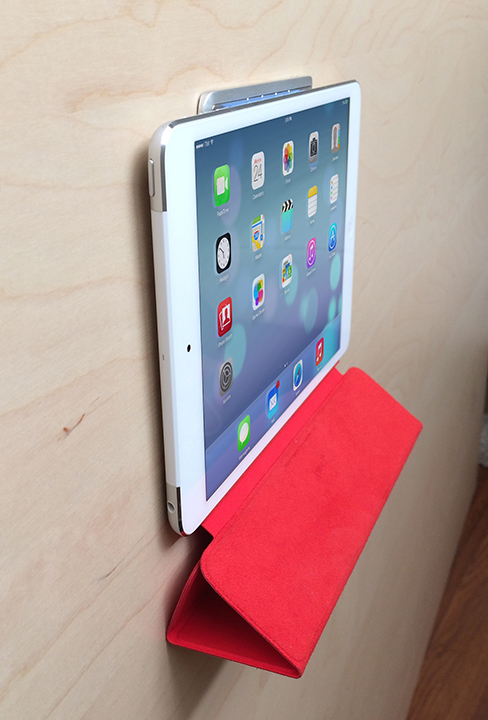 Yes, you can mount your iPad with the SmartCover. We do it by mounting the iPad so that SmartCover hangs from the bottom. This picture illustrates how to do it. Is it possible to mount the iPad in letter orientation (Portrait)? Yes, it is possible to mount your iPad in portrait orientation. To do this you will need to use two MagSticks. Does MagBak work with other tablets or devices? Since MagBak is made of silicone, the pads will fold to fit the form of other tablets and devices. We haven't tested this and do not recommend it. Is MagBak compatible with iPad 1? No, MagBak Classic is designed for iPad 2,3,4. MagBak Air and Mini are designed for iPad Air and Mini, respectively. How do I install MagBak on my iPad?